Tell us about yourselves and your interests. Elena: I love spending time with my family and friends. I enjoy cooking meals and hosting gatherings at our house! Listening to music and finding new songs is another hobby. I love being outside. Golf, skiing and biking are all activities I enjoy doing with my husband and our three children. Courtney: My husband Joe and I, and our 4 kids recently moved to Hingham this past September. Our family has been traveling a lot over the past few years for my husband’s company, Spartan Race. I grew up on the South Shore and I’m happy to be living close to family again. I love reading, movies, hanging out with friends and family, having people over for dinner, skiing, being outdoors and living near the water. Your two are a dynamic duo with your fitness routine! What are your workout rituals together? Elena: We have been trying to workout together at least 3xs a week. Usually we set up our schedules together based on what’s going on that week in each of our lives. I find it holds me accountable if I know a friend is waiting for me! It’s also nice knowing that we can grab a coffee or vent about life afterwards. Courtney has a positive outlook and is always there for me to listen and encourage me. Courtney: I met Elena the day we moved here (next door neighbor). Elena was SO friendly and inclusive and just awesome. She told me about Cycle Town and got me to my first class. She literally drove me there, brought me water, a towel and reserved a bike for me. 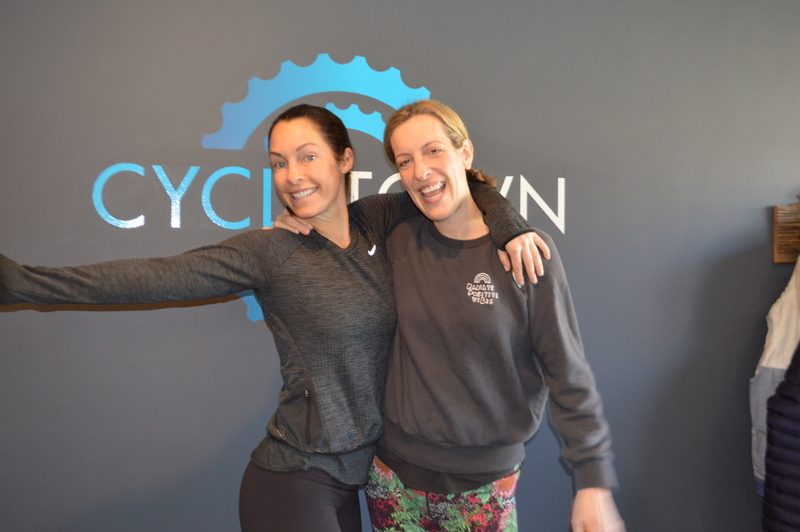 The Cycle Town classes are so fun! I giggled through the first class (with the choreography) but I absolutely loved the music and the great energy in the room. People were totally cheering each other on and the teachers are so friendly and encourage you by name. Plus it’s such a good workout. I’m hooked. The front desk is really cheerful. I like that. Now Elena and I text on Sunday nights to decide which days we are doing spin that upcoming week. I also like to do Bar Method… so we try to alternate days. I book classes ahead of time so I’m less likely to skip or make excuses the day of… there’s always good excuses to bail but I find that my day goes smoother and I feel more energized on the days I get a workout in. And it’s social. We grab a coffee and chat afterwards. What motivates you? On the bike and in life. Elena: My husband Bill, and our three children Elsie, Emery and Eamon! We want to be a positive role model for them. My personal fitness and feeling good is important so that I can maintain a clear head and continue to fit into my clothes! I try to demonstrate patience and kindness and hope that they will do the same with their family and friends. I care about how we make each other feel and want that to be present in our family. On the bike, it’s my friend Courtney! And the music. Sometimes I hear a throwback and I forget I’m working out. Courtney: My family motivates me. I want to be a good role model for my kids and have energy for them… so I try to stay fit so I can live a long healthy life. My husband is definitely into working out and he’s up at 5am doing burpees, flipping tractor tires and crazy stuff…everyday. I go through phases where I am training for a race and I do a little more of that Rocky 4 training but I also really like to slow down and do yoga or barre. On the bike, I like a place to workout with fun people. I get to meet nice people and I find that working out consistently makes me happier and keeps everything in balance. 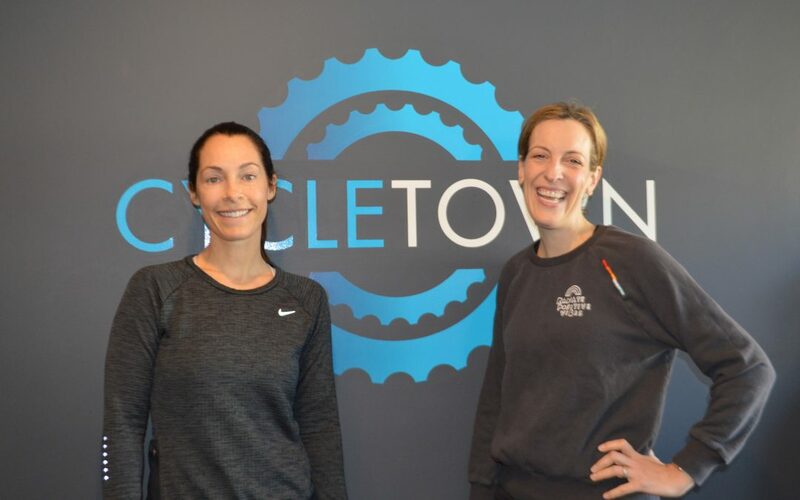 Why do you love Cycle Town? Elena: Learning new music…and sweating! The instructors are always positive and have great energy. I love when they give a message that makes me smile or laugh. Riding in the dark allows me to clear my mind. I ALWAYS leave feeling better than when I came! Going to Cycle Town gives me an outlet and allows me personal time that is just for me. I often use that 50 min on the bike to think through the multitude of ideas in my head and create a game plan for the day. Courtney: The instructors are awesome and they have great playlists. I love the fun, the cardio, the music and the energy. Favorite move on the bike? Elena: Figure Eights! It’s fun to turn the dial up high and feel the strength and power in my legs!